Sideshow Collectibles is a company that manufactures fine art collectibles. 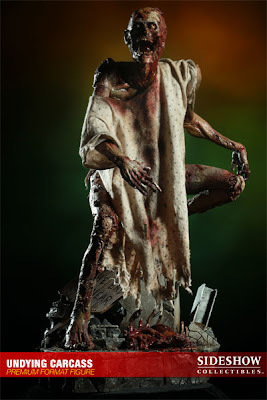 They have created an in-house line of zombie figures appropriately called The Dead. This line of collectibles started and continues with 12" figures featuring amazing detail. 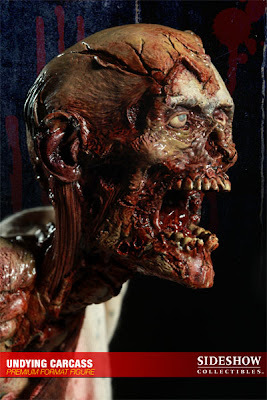 They have also released a trio of zombie head busts (review) and cartoonish vinyl (news) for The Dead. 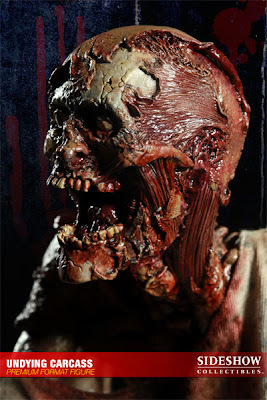 One item in particular that is impressive is their "Premium Format" Patient Zero zombie (review). Sideshow's Premium Format line consists of items that are 1/4 scale (approx 18 inches) and are composed of intricate details coupled with actual cloth material. 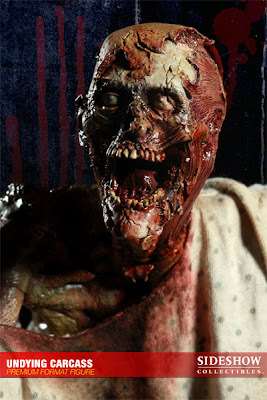 This Friday will see the pre-order window open for Sideshow's second Premium Format zombie. 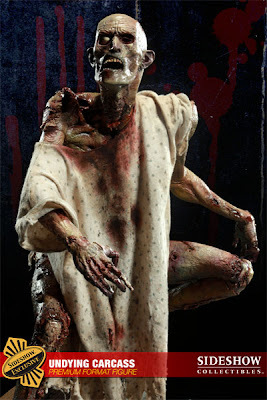 Called "Undying Carcass", we will be treated to what appears to be a reanimated hospital patient. At around $280, make sure you don't need to buy anything soon! The exclusive edition includes a bonus head that can be changed. For full details on how you can order as well as more beautiful pitures, head over to Sideshow Collectibles.